This ceremony is so important in Rwanda and it has contributed too many gorilla tracking safaris to Rwanda, it’s always a joyful activity which is attended by many people especially those interested in wildlife and nature. This ceremony is normally known as Kwita izina which is known as baby gorilla naming mostly carried out in Rwanda.This ceremony is liked by many people in Rwanda and it’s mostly recognised by the country since it’s mainly done to prove the status of mountain gorillas. 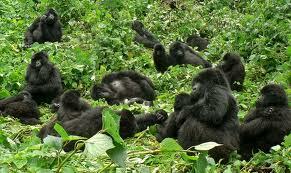 Many tourists have travelled to Rwanda in order to engage in the function of naming the mountain gorillas which has greatly increased the mountain gorilla trekking safaris.In addition to the mountain gorillas in Rwanda, the country has got many other tourists attractions which have attracted many people to come for safaris to Rwanda. These other activities include ; chimpanzee tracking, sports tourism, culture of the people of Rwanda and many other national parks which have a variety of animals , birds and many species of trees which are enjoyed by the tourists.Many VIPS travelled to Rwanda this year in order to name the gorillas, these were named different names according different situations, and these include names like Kasimbi, Ganza which means always dominating, and the Ikigega which meant granary. All these names were given to different baby gorillas by the people who attended the gorilla naming ceremony. This increased the number of visitors who come for gorilla tracking safaris to Rwanda.The VIPs who attended the ceremony of mountain gorilla naming included; the famous American actor, Isaiah Washington IV, Nigerian Nollywood actor Ramsey Noah, Dr Paula Kahumba, who is the executive director of Kenya Land Conservation Trust .These people largely contributed to the increase of revenue to the tourism industry in Rwanda.